In the previous post, we already prepared the main ABAP program that responsible to display a flight schedule from database table, SPFLI in an ALV list using CL_SALV_TABLE class. Today, my goal is to show you how to enable ALV layout settings for the users at the top of the ALV list. To provide this functionality, let me introduce you our first CL_SALV setting class, called CL_SALV_LAYOUT that we can use via the CL_SALV_TABLE's instance method, named GET_LAYOUT(). This method will give us an instance of the CL_SALV_LAYOUT class that we can use to enable the layout settings feature for the users. The development workflow is going to be really simple, namely we are going to organize the different settings (mentioned above) into small, clearly named subroutines, then place the calls of these routines one by one in the existing INITIALIZE_ALV subroutine under the FACTORY() method call. I like this approach, because it ensures a high transparency in our code without using unnecessary "dead comments". As I mentioned before, we are going to put our ALV settings into the subroutine, INITIALIZE_ALV in the following order: first we call the FACTORY() method of the CL_SALV_TABLE to get an instance of it, then call the subroutines that responsible for different settings. DATA message TYPE REF TO cx_salv_msg. We introduced a new subroutine above, named ENABLE_LAYOUT_SETTINGS. Let's implement it! As I mentioned above, to set the layout settings feature for an ALV list, first we should get an instance of the CL_SALV_LAYOUT class. 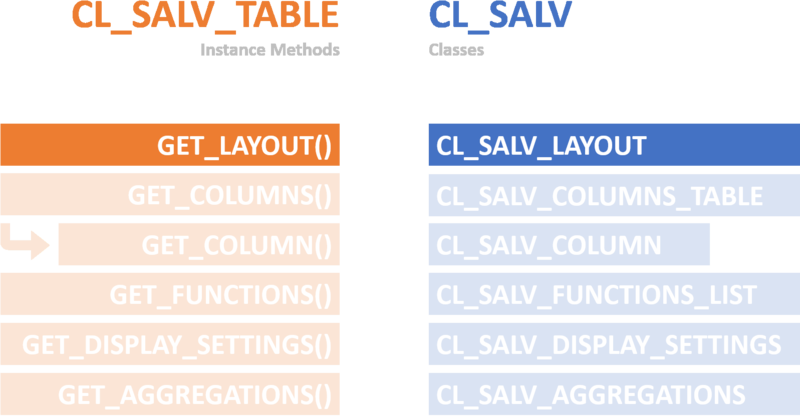 We are going to get and save an instance of the CL_SALV_LAYOUT in the variable, called LAYOUT_SETTINGS by calling the instance method of the CL_SALV_TABLE class, called GET_LAYOUT(). As we get a CL_SALV_LAYOUT instance, there is nothing left then using its instance methods to set the expected behavior. We usually set a unique key to make the different ALV layout settings unique between each other, and set a restriction for saving the layouts. To set a unique key we use the SET_KEY() method of the CL_SALV_LAYOUT class that requires a SALV_S_LAYOUT_KEY structure as an import parameter. So, we define a LAYOUT_KEY variable with the type SALV_S_LAYOUT_KEY, then set its REPORT field using the SY-REPID system field (contains the technical name of the program: ZDEMO_ALV02), and at last we call the SET_KEY() method with this LAYOUT_KEY variable. As you get familiar with the members of the IF_SALV_C_LAYOUT, there is nothing left then calling the SET_SAVE_RESTRICTION() method with one of the above mentioned attribute (in my case I use the RESTRICT_NONE). DATA alv TYPE REF TO cl_salv_table.